JEE Main 2018: Central Board of Secondary Education (CBSE), organised competitive entrance examination JEE Main 2018, via offline or pen and paper mode of JEE Main 2018 today. The offline mode of the exam has been scheduled for morning and the candidates who have registered attended the paper 1 in the morning while the paper 2 will be concluded in the afternoon shift. The students who have registered for JEE Mains 2018 is around 10.4 lakh in total. The official JEE Main Answer Key 2018 of this exam will be released on the last week of April. However, several private agencies like Allen are expected to release unofficial answer keys after the completion of the exam today. First responses from students suggested that the paper was not as tough as they expected. Some candidates said the physics section was the toughest among all other subjects. For most JEE Main aspirants, this year’s Mathematics portion was easy and questions from Chemistry section were in the expected lines. According to an expert, this year’s paper was similar to the last 2 years’ papers in terms of difficulty level,. “The paper was moderately easy. A student should not have had much trouble completing the paper as well”, said Rajshekhar Ratrey, Vice President Educational Content, Toppr.com. He also said the JEE Main 2018 aspirants have also found similarities between the weightage of marks in this paper, and the 12th board syllabus. In Ratrey opinion, the JEE Main 2018 cut off this year should fall between 95 and 105. Meanwhile, Prof UdayNath Mishra, Chief Academic Officer, BasicFirst said expected cut off is 80 (+-5%) marks out of 360. JEE Main 2018 paper 1 in Pen and Paper mode was held at different centres located in 112 cities throughout the country and abroad today. Paper 1 for admission to Bachelor of Engineering (B.E.) and Bachelor of Technology (B.Tech.) was held from three hours from 9.30 am to 12.30 pm. The paper included questions from Physics, Chemistry and Mathematics. The examinees were given question papers in English and Hindi medium while examination centre cities in Gujarat, Daman & Diu and Dadra and Nagar Haveli were given question papers in English, Hindi and Gujarati. Entry in the examination hall for frisking for morning shift was started at 7.00 am while the test commenced from 9.30 am and it was concluded by 12.30 pm. 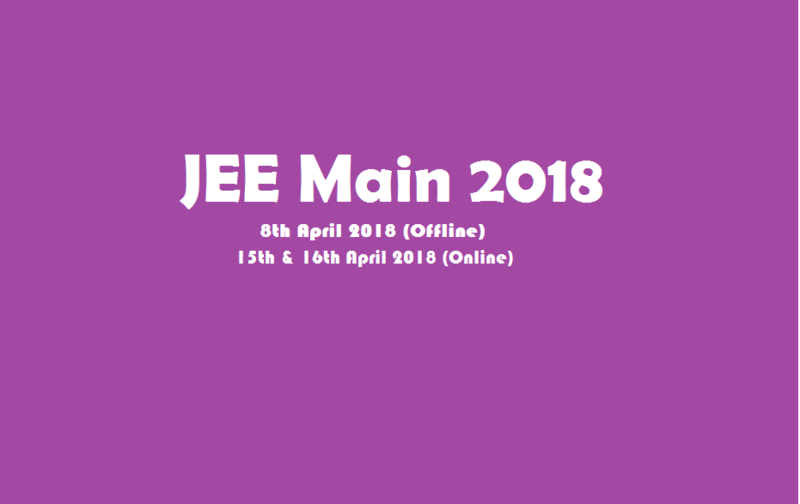 The JEE Main CBT or computer based test will be held on April 15 and 16. The Board will use different sets of question papers on the different shifts on different dates of examination. Previous articleJEE Main Answer Key 2018 Out Now! Next articleBaahubali Prabhas To Marry Chiranjeevi’s Niece Niharika Konidela?